Taken from Scout-Finch's cozy mystery bookbox. Thanks. This is the second one of these I've read in this series about Greenwich village hat designer who becomes involved in murder. These are fast, easy reads in the cozy genre. Enough character developement to like the characters and the storyline is also pretty good. Mystery enough to keep you interested. 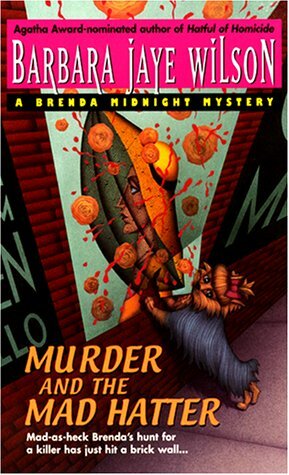 In this one, Brenda Midnight, the millner, is conned into marrying her boyfriend's sleazy agent. To get even she steals his famous bra collection off his living room walls. Unbeknowst to her at the same time as she was stealing the bras from Lemmy, his upstairs neighbor was being murdered. When she finds out about the murder, she is sure it is the arrogant man toting a briefcase who hurried down the stairwell when she was sneaking out and ran into her. She gets her set of goofy pals to help her solve the murder. Putting in my Perpetual Cozy Mystery Bookbox, Round #2 for someone else to enjoy. Hopefully, it will be someone other than usual group of suspects who've already read it. I am selecting this book from Martie-Kr's Cozy Mystery Bookbox. This is a new author to me, so I am looking forward to reading it later on. Offered up on Shroffland and LoriPed's Suspenseful Mystery VBB. Sending out to lovamystery. Enjoy. It has arrived and it looks good. Thanks Loriped. This was a fun mystery and I am sure I'll read more in this series. Picked up at tonight's meetup at Rhizome. Looks interesting, especially as I like hats! This was about average for this type of mystery, but I did like the hats, especially the ex wife hat. Fun. Taking this to meetup, which may become a Game 7 viewing zone. Feel free to join us and cheer or just look for the Free Books sign and help yourself.